Welcome to the Purple Martin House. Purple Martins have been called America's favorite bird. Every season Purple Martins migrate across eastern North America starting in January from Brazil to breed. They depend on people like you to provide safe housing. Here at the Purple Martin House, we'll help you to find a house just right for you and help to maintain your Purple Martin colony year after year. 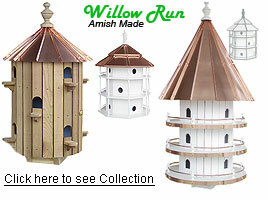 At the Purple Martin House, we feature gourds, houses, poles, and accessories from America's most popular Purple Martin manufacturers, including Coates, Nature House, Lone Star, Heath, Heritage Farms and S&K.